The doctor asks if I have witnessed violence. I want to tell him that I have witnessed enough peace to question the distinction in the meaning of these words. “Keep Silence,” says a smiley face painted with long eyelashes and a red mouth, a seemingly disembodied finger across its lips. The ward at the premier mental health facility is a shade of washed-out coral frequently seen on government buildings, one that is simultaneously pastel saffron. The square block around a courtyard of palm and bamboo trees is neater than any public hospital I have been in. Every ten steps or so is a handwritten sign: “Keep the area neat and clean”, “Don’t throw waste here”, “Don’t leave the tap on”. In the middle of the courtyard is what locals call a champaka tree. Its full-bodied bloom scents the air in the evening rain. On one side, garments hang from a clothesline to dry. The saris are draped twice over. While coming in, a nurse had explained, “No sharp objects. No loose or long garments.” Anything can be dangerous but it seems difficult to ban domesticity altogether. The nurse tells me of other rules for patients, chief among which is that I am to inform them if I want to go out of the building, if only for a cup of tea. I need further permissions from the doctors and to sign a logbook to go for a walk let. “When did I surrender myself like this?” I mutter to myself. It seems I've flown in from one curfew only to walk into another. In Kashmir, there had been a continuous siege, in its 46th day as I wrote this. More than 70 young men, women and children have been killed by the armed forces in the protests for azadi that followed the killing of 22-year-old militant leader Burhan Wani on July 8. More than 6,000 protestors have been injured since then and over 4,000 cases of fire-arm injuries caused by the armed forces using live ammunition on protestors have been registered. 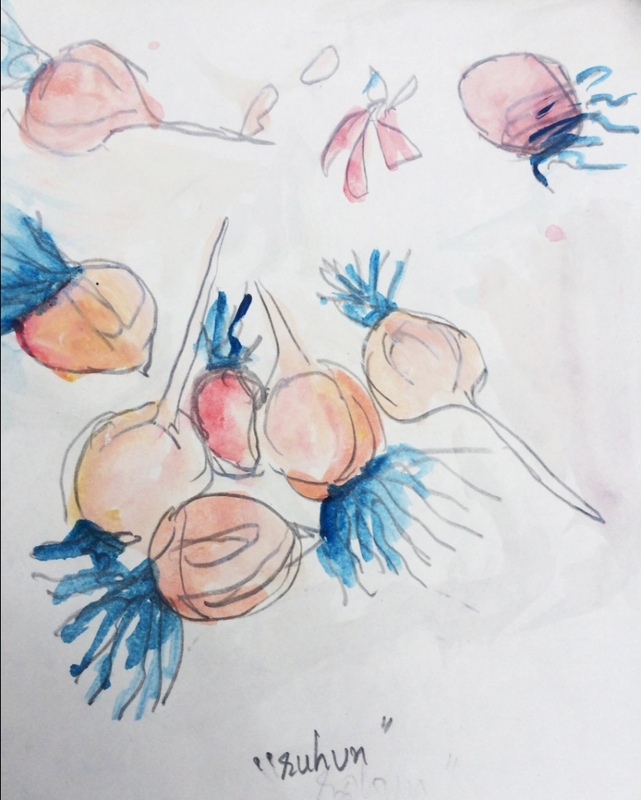 'Memory of Shallots', Mahum Shabir. The day begins when the lady in a pink coat draws out the mop from a pail of water. The borders of her sari skirt the floor. Her bangles produce a halting jingle as she works, left to right. In the mornings, we are scheduled to attend a yoga session. The teacher, a middle-aged man, slight paunch and a turmeric tilak on his forehead, begins with a disclaimer of sorts. He says that the mantras we will chant during meditation are only a tool of teaching what he calls “scientific yoga”. But he says that if people don’t want to recite them for religious or other reasons, they are free to not do so. The session ends after 30 minutes. I feel relaxed. As we are about to leave, the nurses ask for a minute, “Let us stand and sing the national anthem please.” Almost everyone stiffens up in preparation. This time, no disclaimers are issued. For a moment, I just stand there, affixed to the floor. My first thought is I should not make a scene and try to stand through this. Then the hymn begins – jana, gana, mana – and as if by some genetic preset, my body walks me out of the crowded room. I can feel the eyes of the nurses in their spotless whites, with their hair tied neatly in buns at the napes of their necks, boring into the back of my head. It seems that loyalty to the Indian nation is assumed to be the fact of a sane life, like the breathing exercises we did, that the only people who refuse are those who do not know what is good for them – the unreasonable – like the “unemployed”, “illiterate”, “misguided” youth pelting stones on the streets of Kashmir. In the Indian national imagination, unruly, ungrateful Kashmiri Muslim youth with a mad gleam in their eyes chase a mad dream called azadi on the streets. They are wicked children, at best, irrationally idealistic, at worst, miscreants out to create law and order problems. Perhaps, as has been suggested by the minister for education no less, it would all stop if they went to school, where they could sit at their desks in shiny black shoes. The school would then become the sanatorium. They could be educated about what is in fact good for them. Here, Islamophobia and colonising patrimony are so deeply intertwined with the idea of nation that even such brutal violence in which more than 400 protestors – many of them children­ – are blinded with pellets of the kind used for vermin-control is thought of as tough love from Mother India, necessary to make insolent Kashmiri children see, in the act of blinding them, what is supposed to be right in front of them. 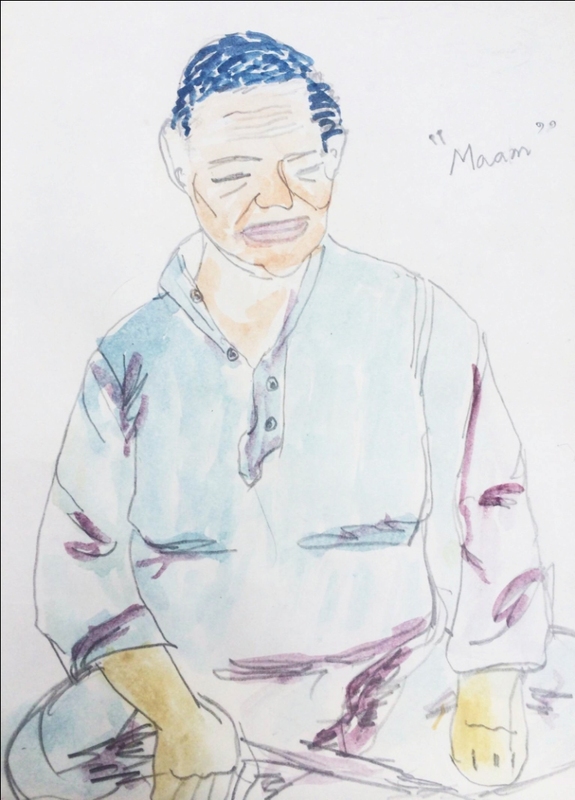 'Memory of Grandmother', Mahum Shabir. In my five days here, I meet a psychiatrist, a man with silver hair and a calm demeanor three times. He says Post Traumatic Stress Disorder is being explored in previously uncharted ways, in the United States in particular. He asks in one of our meetings if I have witnessed violent events, considering that I was born, have grown up in Kashmir. I want to tell him that I have witnessed enough peace to question the sharp distinction in meaning that the words lend themselves to. In April, for instance, reports of a teenage student in 12th grade from Handwara who alleged that a personnel of the 21 Rashtriya Rifles, camped right outside their school had molested her, made headlines on Indian television. In the ensuing protests, the army and police killed four young men and a woman in firing. 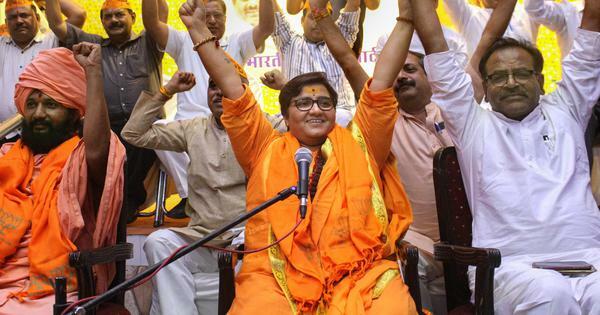 Subsequently, the girl was held in illegal police detention for a month where a video of her vaguely absolving the army of molesting her was shot under duress and widely circulated. 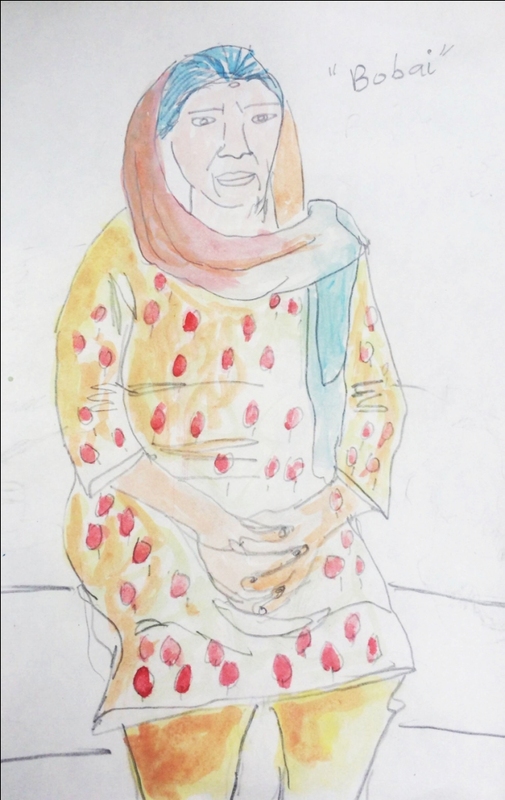 Such state violence, as the girl and her family had to face would hardly be considered exceptional in Kashmir, certainly not in comparison with what is going on now or has happened in the past. The killing of five people, the detention of a 15-year old girl and her father is the violence of peacetime – when tourists still enjoy shikara rides on the Dal Lake. But I do not want to tell the psychiatrist this. 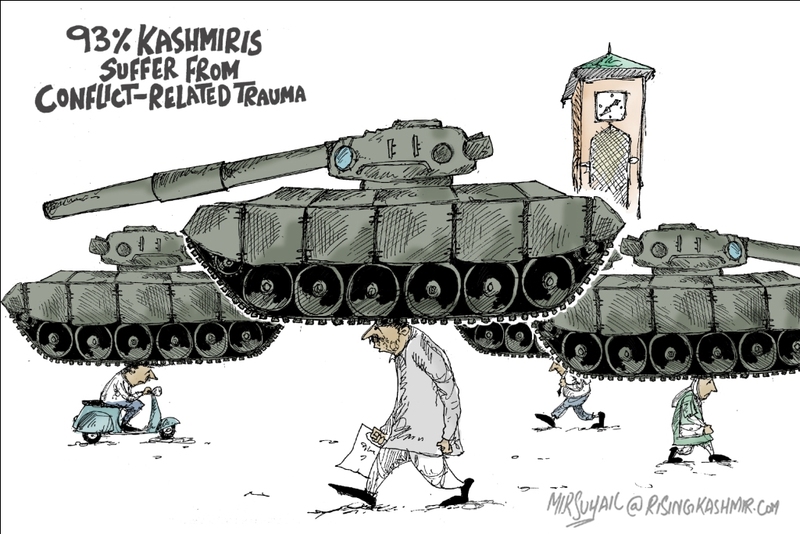 In one of his frames, Kashmiri political cartoonist Mir Suhail drew war tanks on the shoulders of men and women walking in Lal Chowk titled “93 Percent Kashmiri’s Suffer From Conflict Related Trauma.” To me, the act of walking, speaks both of how banal, subliminal “trauma” is ­– in the context of the current siege for instance – as well as how it is an act of defiance, embodied in the consistent calls of the Hurriyat Conference to Chalo/Walk. After the meeting, I head back to my room. At the top of a staircase names have been scrawled into the dust of the panes of a large window. I count 20 panes. In each pane, a name is written with a fingertip. Lit by the afternoon sun, it seems like a memorial. Even the cleaning lady who mops everything down every two hours seems to have let it be. Maybe all of those, whose names are here, were here. Or maybe it was one woman remembering the names of those she remembered. It reminds me of the chinars in Nishat, into the trunks of which lovers’ memories are engraved as letters – “M + N” – or the graffiti I saw before I left on the shutters of shut shops while walking in a curfewed Lal Chowk, “Burhan, Our Hero”, “Burhan Still Alive in Our Heart”. 'Memory of an Uncle', Mahum Shabir. Later in the day I go to the nurses’ room for a blood test. Everything in the room has neat labels on it. Underneath the shelves in the steel cabinet, labels consist of writing on surgical tape ­– “10 mg Dispovan”, “20 mg Dispovan” and so on. Even the water filter next to the cabinet has a label above it ­. It says, “Water Filter”. I suppose there are uses to stating the obvious. Take for example Indians­ – such as those from the liberal-left – who sympathise with Kashmiris on account of the stifling of substantive democratic rights by the Indian state in Kashmir, who will nonetheless affirm their own sanity first through public affirmations of their belief in sovereignty of the Indian state. We have no love lost for Burhan Wani, they say. It is how Bharat main Azadi/ Freedom within India, the slogan used to much effect by Jawaharlal Nehru University youth leader Kanhaiya Kumar, is fundamentally different from Bharat se Azadi/Freedom from India, what the call of Kashmiri youth protestors for Azadi is understood to mean. So while Bharat main Azadi is seen as an appropriately radical slogan voicing the myriad disillusionments of students, Bharat se Azadi is just insanity, especially when voiced by students, fit to be met with the kind of violence it is met with. This is also why comparisons between the response of the state to Jat protestors during the so-called Jat Andolan in Haryana and to those in Kashmir, even if well-intentioned, are misplaced. Meanwhile, I am back in Kashmir, in confinement in my own home just like the entire population of Kashmir. In many areas, people need permission from the gun-wielding Central Reserve Police Force and the recently deployed Sashastra Seema Bal and Border Security Force assisted by Jammu and Kashmir Police to purchase food or medicine or offer prayers. The BSF occupy 20 public schools, in a replay of the situation of the 1990s. Reports say that they stack their guns in classrooms and keep grenades in desks. Hospitals are flooded with the injured and doctors say even those who have not recovered from their injuries are being discharged to make way for new casualties. Additional troops are being sent, a few thousand every other week, to the world’s most militarised zone. It seems that the Indian state sees them as the real doctors and teachers. In preparation for the Independence Day parade in Kashmir, troops arrive in civil buses. They roll out coils of barbed wire with razors onto the streets. On television, we watch as the chief minister prepares to salute the Indian flag. She pulls a rope attached to the pole to unfurl the flag but it falls onto the ground instead. She hurriedly picks it up and holds it out. The show goes on.